Clearly, she forgot she was in costume. Not that that should surprise us. And that’s why women should never be superheroes, drive cars, get jobs, vote……etc. That isn’t really that bad. I mean, he doesn’t wear a mask, and works in a place where cops don’t recognize family. As far as I can tell, nobody wants to know who Bulletman and Bulletgirl are. Besides, there is a lot of modern DC stuff where this happens. I may never get over everyone running around calling each other by first names in Identity Crisis, a crossover based on the ethics of magically altering super villain’s memory in order to preserve their secret identities. Why Doesnt Bulletman Use Guns With Bullets? 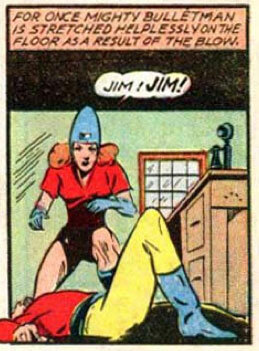 He Should Be Conehead Man. Relax, Bulletgirl. This is normal for most men ‘as a result of the blow’. He’ll get his strength back. Just give him some time and he’ll be ready to go. after seeing that Bulletgirl isnt wearing pants I think its safe to say that Jim is just tired, and they sould do it only at there apartment for now on. Hey Jeff: nothing to do with this entry, but I can’t seem to access any other page of your blog by using the page numbers at the bottom of the screen. No matter what page # you click on, it redirects you to the top/front page. @ gero: Well played, sir! Well played! Hmm, very strange Imp. Thanks for the catch, I’ll look into that tomorrow when I start recovering from this trip. OK, fixed the pagination problem, my apologies. It was an unintended side-effect of something unrelated I was tinkering around with.